Etching is included for FREE! Crystal Vases, Crystal Bowls, Glass Vases and Glass Bowls are elegant ways to show appreciation and recognition. These awards come with Free Engraving! Free Logo available with black and white vector-format art! Small charge applies for logo digitizing if vector-format art is not available. Browse RCB Awards' large selection of engraved crystal vases etched with your custom logo and text. We feature vases by Waterford, Mario Cioni and others. 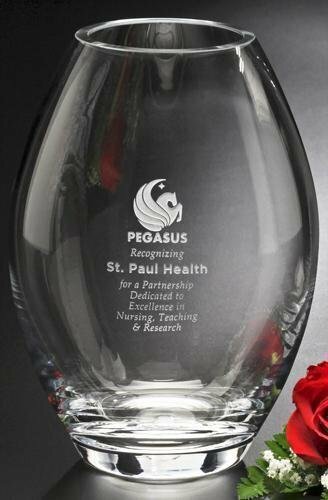 Our personalized crystal vases ship quickly and make a great statement for corporate recognition.